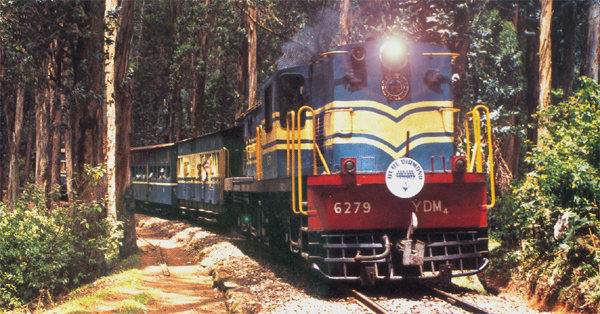 The charming Nilgiri Hill Railway, blue and cream with wooden coaches and large windows, is widely regarded as a marvel of engineering. At the height of 2,600m stands Udhagamandalam (Ooty) The Queen of Hill Stations. The ‘Nilgiris toy train’ connect Ooty to mettupalayam, at the foot of the Nilgiris. The construction of this line was a big challenge as the terrain is rather tricky. It was in 1854 that the first plans were drawn to build a mountain railway from mettupalayam to the Nilgiri Hills. But it was a good 45 years later in 1899 that the first train chugged up this track. This railway is widely regarded as a marvel of engineering. The train itself is a charming blue and cream with wooden coaches and large windows. It is hauled up hills by stream engines, designed and built by the Swiss Locomotive Works. Twelve of such locomotive engines survive even today. The train covers the 46 km to Udhagamandalam in four and a half hours. There are five stations between Mettupalayam and Coonoor - Kallar, Adderley, Hill Grove, Runnymede and Kateri – and, at one time, there were five between Coonoor and Ooty too. Through Wellington, Aruvankadul, Ketti, and Lovedale are still functional, Fren Hill, the last one, was closed down a few years ago. The train, for obvious safety reasons, averages 10.4 km per hour and is perhaps the slowest in India. Built in the late 19th century, the track rises at a gradient of 1 in 12 and has 208 curves and 13 tunnels. It leaves Mettupalayam at 7.45 am and reaches Ooty at noon. Extensive rice fields surround the 7 km stretch between Mettupalayam and Kallar. Soon after is an impressive 21km section through truly rocky terrain. The track passes over 26 viaducts, and twist and blends through 13 tunnels. After a steep climb, the train enters Coonoor, the little hill station known for its tea plantations. From here, the track is uphill till you reach Fern Hill at a height of 2,218m, the highest point on the railroad. Shortly before Ooty, the line dips downhill. If you enjoy taking pictures, keep your camera ready for a few shotsof the viaduct between Kallar and Adderley. This ride is sure to turn the most hardened rail critic into an avid fan. You’ii delight in hthe edge-of-the seat twists and turns as the train runs across tall girder bridges, and over green hills before gently meandering through rolling tea estates. The exhaust beat of the loco never falters, maintaining a deafening staccato which can be heard for miles around. Truly a journey to remember.